We've had about two feet of snow so far, and it's still coming down. 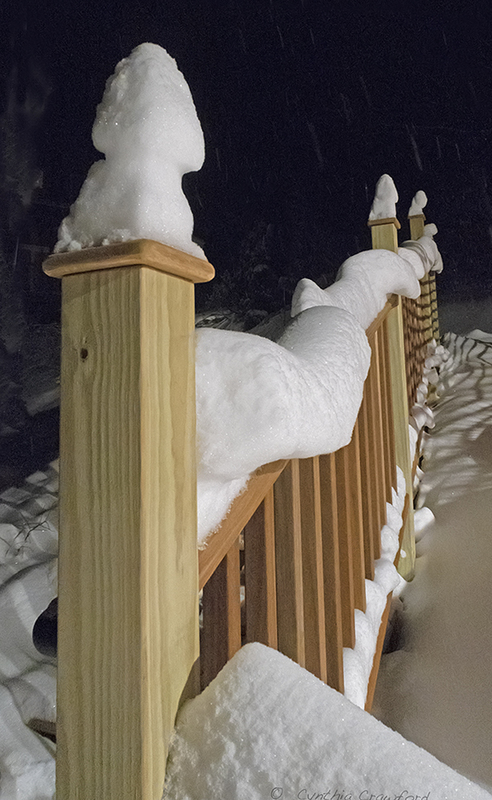 Last night the sparkles were so beautiful-this a railing going down to a shed on our property. I hope it shows something of what I saw. Yes, I can see the sparkles and the angle from which you photographed the railing allows it to fill the frame quite nicely! Your artistic eye has captured the perfect perspective here, and I particularly like the wonderful cotton candy topping along the fence, and the sculptures on top of the posts! As long as we don't see a fraction of this snowfall, I'll be happy. A pretty capture....the bad news is that you will have to shovel all of that snow....lol!